Confession: When I read the advanced notices for Danai Gurira’s Eclipsed, at the Kirk Douglas Theatre I was not thrilled. My reaction when I saw that it dealt with travails of women in Liberia’s seemingly unending civil war was, “Not another politically correct exercise by the Center Theatre Group”. Do not get me wrong; the war was gruesome, a civil war with no good guys, only victims, and a story I should not want to forget. However, “politically correct” theatrical exercises often are more polemic than entertainment. For much of Act I, I continued to hold my grudge. The African accents rendered a significant portion of the dialogue a trial to follow, and the lives of the women are a test of survival under the abusive tyranny of the rebel “CO.” Gurira, however, presents something more than a lesson. She is a shrewd observer of how people adapt and survive under the most inhuman circumstances. She takes seriously her obligation as a playwright to do more than just preach at an audience. Her characters are more than simple captives cowed under subjugation; their very essence has been stolen; they have nowhere left to look for it. This is what can happen when people are deprived of their humanity, terrorized and abused until they are no longer who they were, nor can they even recall their pre-terror notions of normal. 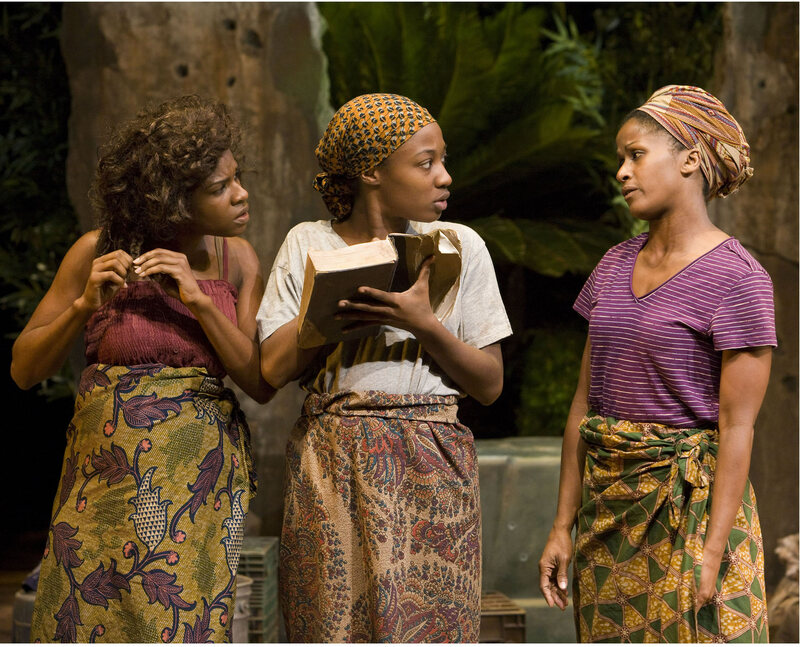 The set is a clearing in the lush Liberian jungle (beautifully designed by Sibyl Wickersheimer). Two women are hiding a third under a washtub. The women are “wife number one” (Bahni Turpin), an “old woman” of 25, and sulking self centered “wife number three” (Edwina Findley). “The girl” (Miriam F. Glover) under the washtub is a young teenager whom “number one” wants to protect from the brutality of the CO who has raped both women and turned them into his captive “wives.” The time is the few months prior to the end of Charles Taylor’s tyrannical rule. There is no visible fence around the compound, only the terror of what they would find if they tried to escape, the tiny modicum of protection the guerilla “CO” affords them, and the subsistence ration he gives them to keep them reigned in. In return they are there for his brutal sexual pleasure and personal service. Periodically he gives “number one” bags of meager goods he has pillaged from the villages he and his men have conquered. The latest bag has a worn, coverless book, useful only as kindling to the two illiterate women. “The girl” whom they were hiding from the CO excitedly stops “number 3 from throwing pages on the fire and, to their wonder, begins to read it. Apparently it is about President Clinton at the end of his term and after. The women become enchanted by the story, identifying Monica Lewinsky as his “wife number two,” making snide comments about Hillary, and seeing Clinton as the “CO” over whom they swoon when they look at his pictures. They are crushed to learn he is no longer the “CO.” The interpretations they conjure up from their own experiences are charming and revealing. “Wife number 2” comes by. She is now a self selected outcast from the female compound but self possessed, well coiffed, wearing trendy jeans, swaggering, and sporting an AK 47 over her shoulder. She has found her self-respect and some level of immunity from sexual attack by becoming a rebel soldier, a part of the coterie of similar women who existed in the waning days of the revolution. She is glamorous and appealing to “the girl,” who by this time has been discovered and abused by the “CO,” despite the other women’s efforts at protection. The rites of initiation into the ranks of the women rebels are brutal and sadistic too; the AK 47 is not a fashion accessory. “The girl” is torn between what she will have to do join their ranks, and the seductive appeal of glamorous “wife number 2”. The last character is Rita (Michael Hyatt), a matronly woman filled with self-confidence even greater than that of the woman soldier. The difference is that her self-confidence is bred from having been a successful businesswoman in Monrovia and from being part of a group of like-minded women who formed a group of “Peace Women.” These women bound together and ultimately caused the UN to take notice, bringing the Liberian conflict to an end. The tension mounts very slowly then comes to an abrupt end when the women suddenly learn that the conflict has ended and they all are free to leave. Though the effect at the climax at first leaves you feeling, “wait it can’t just bam end like that.” It is exactly how the war ends for these women. There is no future they can conjure up for themselves. They know no place in a non-war environment. They will always be prisoners of the brutality they have endured. We do not know, any better than they do, what they should or can do next. Sadly, I think “that’s all there is” and there is no way for most of the victims to just dance out of their imprisonment.